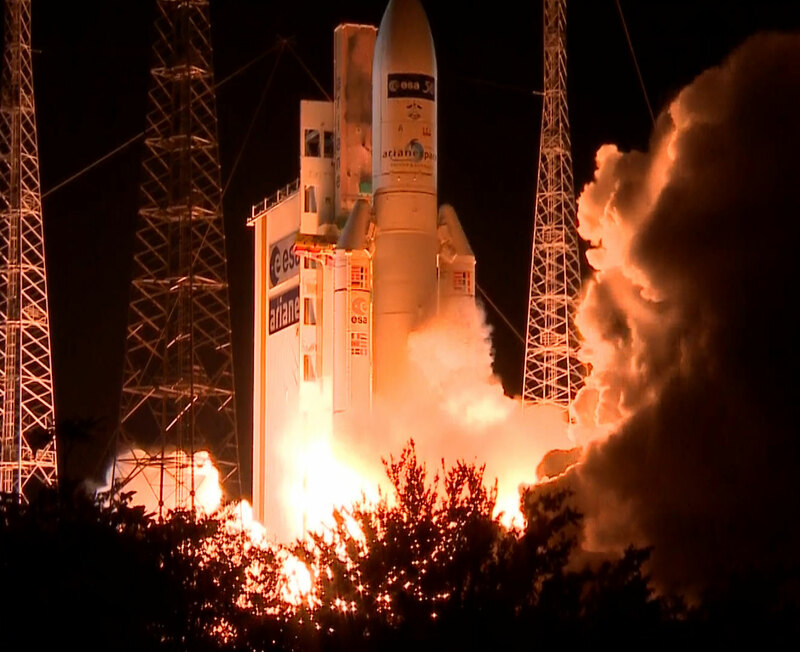 Europe’s fifth ISS resupply spacecraft was orbited tonight by an Ariane 5 launcher from the Guiana Space Centre. The ATV-5 will dock with the statiion on 12 August. Liftoff Ariane 5 with ATV-5 on board. Credits: ESA-CNES-Arianespace/Optique vidéo du CSG. A new Ariane 5 ES launcher soared skyward from French Guiana tonight at 20:47 local time (01:47 CET), orbiting Europe’s fifth and final resupply spacecraft, the ATV-5 Georges Lemaître.The cargo spacecraft is now on its way to the International Space Station (ISS) under the close watch of the ATV-CC control centre at CNES in Toulouse. And the ATV Georges Lemaître has plenty of work on its plate, as it will be testing out a number of futuristic space systems before its scheduled docking with the station on 12 August.To this end, it will fly for one hour and a half just below the ISS, guided by the engineers at the ATV-CC, three days and a half before the docking. The ATV is ferrying food, water, oxygen, fuel, spares andscientific equipment to the station’s crew of six. It will remain berthed to the station for six months, during which it will be loaded up with waste beforre undocking and burning up in the dense layers of Earth’s atmosphere. Photo report of the key phases of launcher and spacecraft preparations for the next launch in Kourou.